Reading new authors makes me excited every time. It is like first date: Is she/he going to like me? Am I going to like her /him? I started reading Ferrante’s novel with these feelings. I am sympathetic to Italian life. I have the feeling that they are kinda close to our Turkish living. Cosy kitchens, strong family relations and trespassing individuals’ lives all the time having no idea of individual space. I think I was right about my stereotypical approach towards Italians. And of course there is this unseen tie between all social classes of the world. More or less same problems, same expectations from life and same disappointments. Ferrante seemingly tells the story of two girls Lina and Lila. However, beyond these girls amazing imagination and survival strategies towards life you see Italian working class way of life. Poor neighbourhoods and increasing estrangement of young people from their families especially thanks to education. Similarly in Turkey education is still the major tool for social mobilisation. Estrangement from old habits, families and poor and ugly neighbourhoods is inevitable for educated young people. I am putting Turkish book cover that I liked more than English cover. This story somehow touched my heart because I had a more or less similar friendship. I am coming from a working class family too. My childhood friend and I always dreamed of being writers. She stopped school after high school and got married in couple of years later. I continued my education that I became a PhD finally. Invisible distance between us increased in years. She wrote an unpublished young adult novel couple of years ago which I did not quite admired. When I read Ferrante’s novel, I remembered all these timeline. I had this awkward movements when you feel like someone spied on your life. I do not think I need to say more about how beautifully written this novel is. It gave me that bitter sour feeling but I loved it. 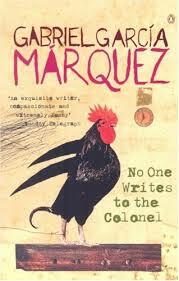 I love Marquez’s novels. I like the way he builds a story’s structure, plays with it, makes fun with the reader, keeps it simple but impressive and mocks us with his surreal characters. His characters are a part of Latin American beliefs, culture and history which my Middle Eastern side does not find hard to believe. 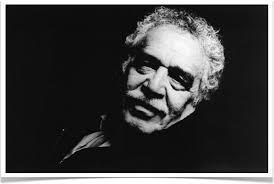 Also as a sociologist, I like the way how Marquez narrates common reactions of his society to certain events. For instance, in Chronicles of a Murder, he follows a person who is going to be murdered in streets of a Columbian city. Although everyone knows (even we know from the first sentence of the book till the end) this guy is going to be murdered, people prefer to keep silent. This is not because they hate this guy but because most of them thinks that someone else will take responsibility to tell him about his fate. In No One Writes to the Colonel, we observe a waste expectation of a Columbian colonel for his retirement salary. While time passes, poverty, illness and hardships of life overcomes colonel’s and his wife’s expectation for this salary. Everyone loses their belief in his chances to get his salary while colonel keeps his faith in it. Colonel’s long expectation reminds us that emptiness in age’s heroic sacrifaces. Although Colonel had given much for his country, as is presented tragic comic way, his efforts are not appreciated in return. This short novel is also a literal critique of the day’s politics and corruption. A large herd of pigs was feeding there on the hillside. The demons begged Jesus to let them go into the pigs, and he gave them permission. 33 When the demons came out of the man, they went into the pigs, and the herd rushed down the steep bank into the lake and was drowned. *Certain leader’s abuse of common people for their different aims. Russian Atheism has never gone further than making a joke. On the other hand, Dostoyevski does not avoid to criticize conservatism too. Conservatism’s failure to deal with modern revolutionary ideals is also underlined via different characters in the book. City governor’s day-dreamer mood during times of revolutionary break troughs is worth to mention as a representation of conservatism’s position against people’s seek for more democracy and power. Also, day’s elite’s lust for luxury and high social standards is criticized as blindfolding them towards newly appearing movements in the country. One must really be a great man to be able to make a stand even against common sense. The touching quote from Bible at the beginning of this piece takes place in Demons’ first page. 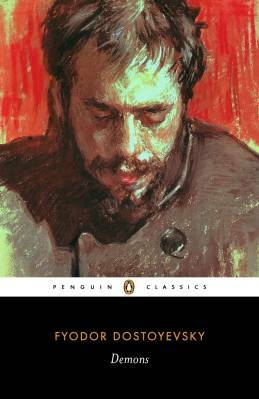 As I read thoroughly, I realized this possessed man represents Russian Empire which is poisoned by foreign ideologies as Dostoyevski claims. Dostoyevski also points a finger to sacred (or conservative) truth which he believes Russian Empire’s only independence lies within. 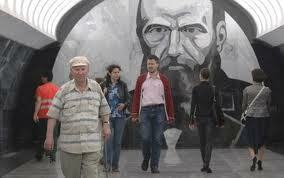 For me, Dostoyevski as an idealist conservative tries to tell us that exported ideologies are mortal unless they are fed by realities, beliefs and culture of the society within which they appear. Otherwise, as is repeatedly said “revolution devours its own children”.